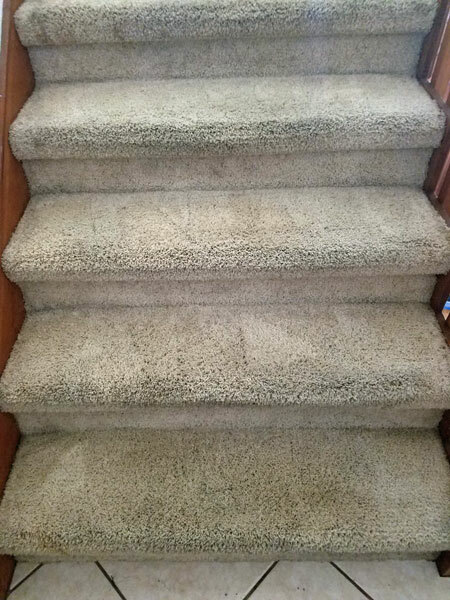 Can you believe the difference between these before and after carpet cleaning photos taken in Tampa FL? These stairs are covered in a really thick shag carpet that collects soil easily. Add two dogs to the mix and you get a recipe for heavily stained carpets. The dogs are often outside frolicking in the sandy soil of Tampa FL and no matter how much you wipe their feet when they come in they bring sand and soil into the home. Using Chem-Dry's proprietary hot carbonated extraction process the sand was exploded from the carpet fibers and extracted through a powerful truck mounted cleaning system. The carpet cleaning process included pre-vacuuming, a pre-conditioner, and power brushing of each step before they were extracted. A lot of dog hair was also removed from the carpet through the vacuuming and brushing process, making it easier for the soil and sand to be extracted. 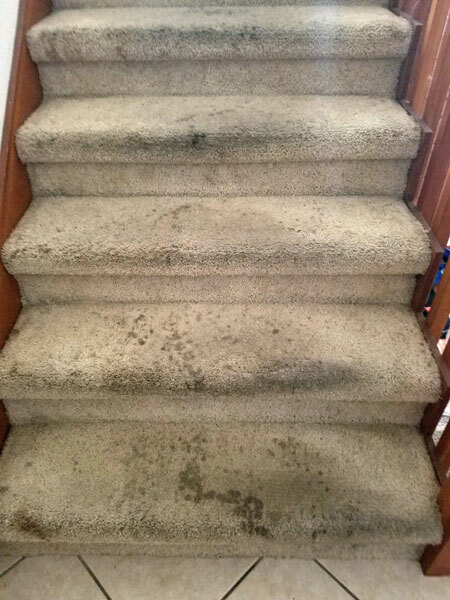 Not all carpet cleanings needs this many steps to ensure a good cleaning but it's nice to have them in your bag of tricks when they're really needed. This was an extreme carpet cleaning that required extra work but in the end it was worth it. This type of shag carpet is not that common place in Tampa FL and it's not a carpet I would recommend if you have pets. But, if you can't resist owning a lightly colored shag carpet and few pets make sure to have your carpets cleaned about every 6 months to avoid staining or carpet damage.